Occasionally, customers would say things to us like, "I scheduled my email but it never sent." We spent countless hours searching for what happened. Then, an idea began to reveal itself, "maybe people were not even pressing the semi-confusing 'enqueue' button in the first place." So, we simplified the way you send scheduled emails. 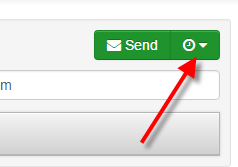 Now the "Send" button has a clock and drop-down as part of it. Thus, "sending" and "scheduling" happen in the same place.